“Dry Dock” – Beginning as a novel and ending as motion picture. This action packed fiction is sure to be as exciting and as popular as many that came before it. We’ve seen Airport, Towering Inferno, Twister, Anaconda and now it is time for Dry Dock. 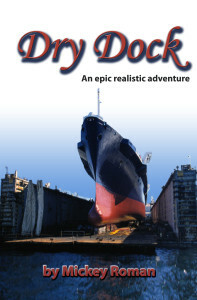 “Dry Dock” as a motion picture has been an idea in the making for several years but finding the right people has been the challenge. From idea to novel to film – now that we have writers, screenplay writers, graphic artists, kindle publishers and movie directors for full development in the hand, we have been able to calculate our cost If you want to contribute to to the Dry-Dock Project, we’ll send you a free copy of the book in Kindle format or in paperback format as soon as it is available. We have now release our fully fledged 300 page Novel in eBook format as well as in paperback. Right on Schedule.